I’m late as usual in sharing my favorites for this past month. Spending a week out of town with family and working on taxes (ugh) has me a bit behind. 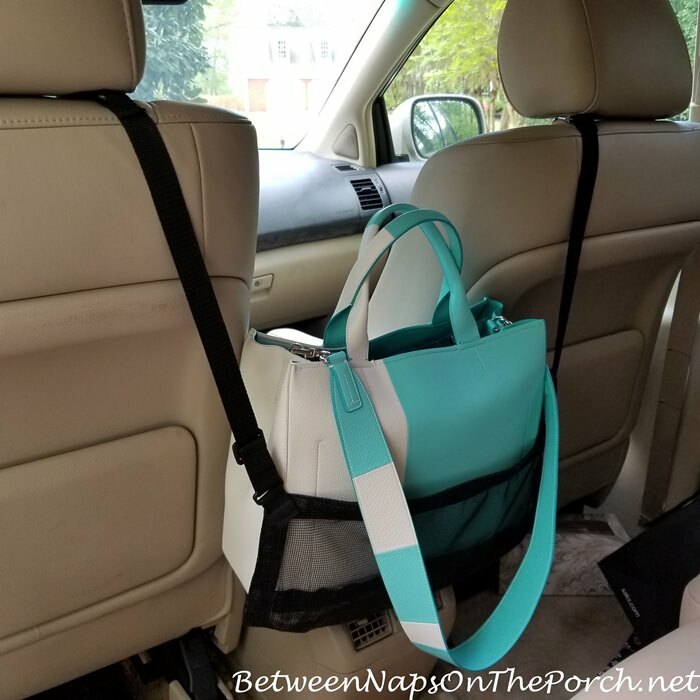 My most favorite item for the month of March has to be this car handbag holder that I shared a few weeks back. It works exactly as I had hoped it would keeping my bag out of the sun and from flying off the seat into the floorboard if I have to brake suddenly. A few days ago I was carrying a larger bag that’s kind of a small tote. I ended up lowering the holder a good bit (it’s adjustable) so now it’s positioned lower and closer to the back of the console than it was in this picture below. I wish I had thought to take a photo. If you would like to see how it looks with a larger bag/tote in place, let me know and I’ll take a photo and add it to this post. Definitely loving this item! You’ll find this handbag hold here: Handbag Holder for Car. 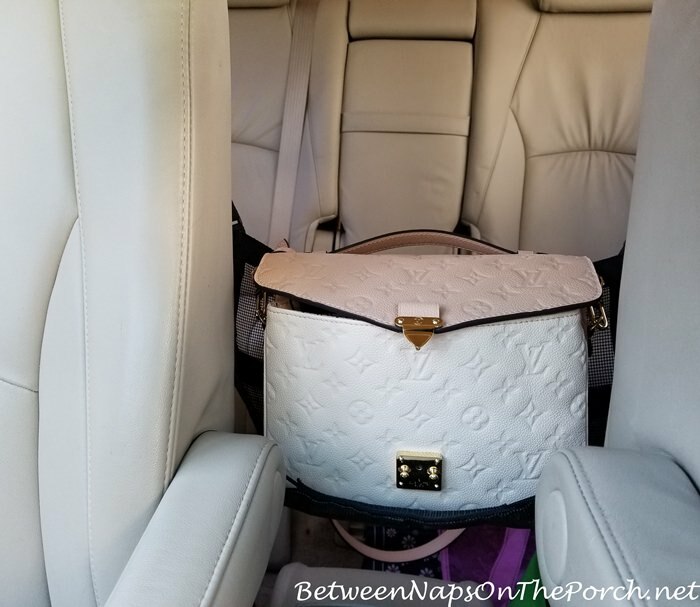 See my previous post about this handbag holder with more detailed photos here: This 16.99 Product Changed my Life! Update: A few folks requested I add some photos to show how a larger handbag/tote fits in the holder. Here are two photos I took this afternoon with the tote I took with me to Ohio this past week. I used it for a few days after I returned and that’s when I discovered a larger bag/tote works fine in the carrier/holder. As mentioned, I lengthened out the straps (which are adjustable) a week or so ago. That worked out even better for the tote since it’s taller than a regular handbag. So the carrier hangs several inches lower than it did when I first installed it. For reference, this bag/tote measures 13.3 inches wide x 5.7 inches deep x 11.6 inches tall. 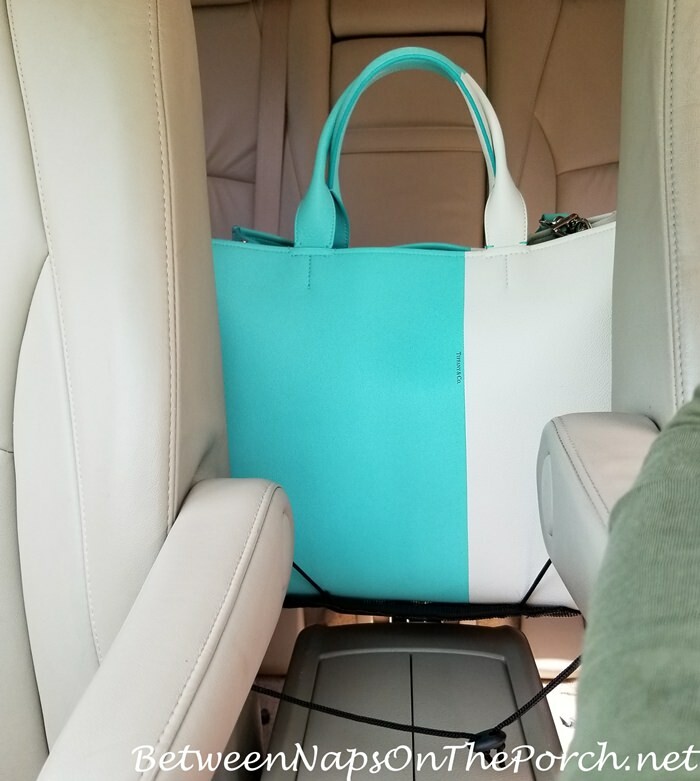 Again, you’ll notice I have the cording draped through my armrests on the two front seats since I don’t have a console that opens from the front as one would normally use for this handbag holder. My console works via push button and opens in the center. But I still made it work and the holder doesn’t budge, even if I lift up one of the armrests. Very pleased with how this has been working for holding my handbags/totes in the car. Some tips: I find a bag will hang a bit more even/straighter if the two front seats are positioned about the same distance forward/back. It still works fine if one seat is further forward or back, but it just hangs at a bit of an angle. Still works, though. I’m hooked on an app called, Happy Color. I just discovered it after a YouTuber I follow shared it in a video. It’s sooo addictive! I rarely use my iPad, but it’s gotten quite a bit more use over the last few weeks than it has in a very long time. Happy Color definitely makes waits in airports and plane flights pass quickly. I needed a stylus pen before I wore my fingertip out! Ha! So I purchased this set and I really like them. They are perfect for an iPad, notebook, phone or any device like that. You’ll find this set here: Stylus Pens. I’ve been searching forever for trash bags that were easy to use in my 13-gallon size kitchen trash can. Seems like most bags are too tight to easily get over the rim and/or they never cinch up and tie properly when it’s time to tie them up to dispose of them. The ones I’ve been using are especially bad, even though they are a well-known name brand. I found these recently and they had outstanding reviews (91%-5 Star after 1,136 reviews) so I decided to give them a try. I ordered the biggest set (270) and I will not need bags for a very long time. If you would like to give them a try before committing to 270 bags, you may want to order the next size down, which is 90 bags. The quality is excellent and I’m very pleased with how well they fit over the rim of my kitchen trash can. They do not slide off the rim since they are big and deep, not so shallow like so many bags are these days. Also, they tie up beautifully…no more flimsy straps that break or don’t close off the bag completely. Very happy with these and will definitely order more when I need them. They are available here: Trash Bags. I’m enjoying this pretty sun hat I ordered recently. I’ve worn it a few times and gave one to my daughter-in-law, as well. She wore her hat on an all-day outing to Keeneland in Lexington, Kentucky that she and my son attended with friends this past week while I was there visiting. I’m looking forward to wearing it a lot this spring and summer. I hate putting sunscreen on my face, this hat keeps the sun off my face so I don’t have to. You’ll find it in 4 colors here: Sunhat. Psst: The code TNUCKab416 will give you 10% off if that code is still valid. That’s the one I used when I ordered my hat. The second season of Agatha Raisin is available to watch on Acorn now, but unfortunately, they haven’t filmed that many shows yet. While I wait for the rest of the season to appear, I came across the whole first season (9 episodes) available on DVD. Awesome! Since it’s so rare I find anything I like to watch these days (everything is usually too violent for my liking) when I saw the first season was available on DVD, I had to purchase it. I love that this show is filmed in the Cotswolds. The show is original, intriguing, funny and entertaining, but I’d watch it just for the houses and scenery! lol Yup, I really would! 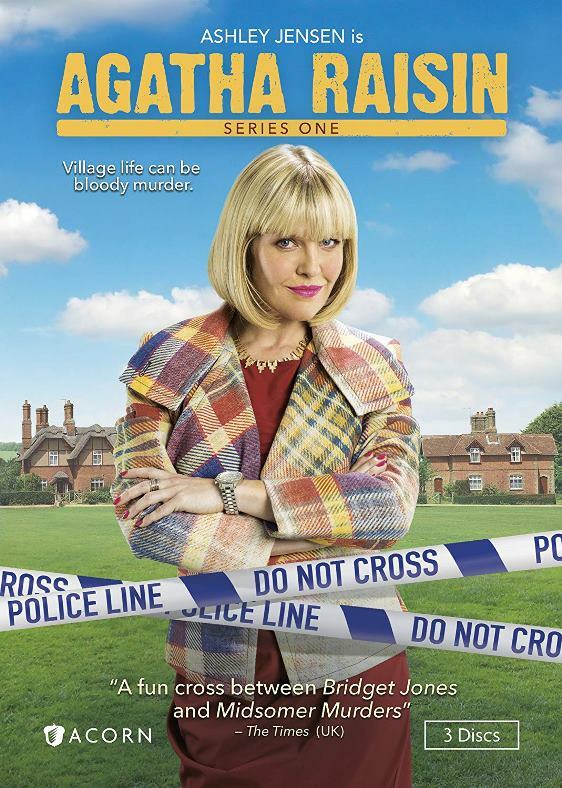 If you’re an Agatha Raisin fan, you’ll find the whole first season (all 9 episodes) available on DVD here: Agatha Raisin. It also includes some behind the scenes”featurettes” and a photo gallery. I love knowing I have it just in case Acorn goes away one day or no longer has the past episodes available. I have to share this cool thing I saw/learned the other day. I was returning something in a local store and the very nice gentleman who was helping me was having trouble reading something on the terminal/computer he was using to complete the return. He took out his camera and took a photo of the thing he was trying to read, saying he had left his readers in his car by accident. So what he does when he runs into this issue is he takes a photo of whatever he is trying to read, then uses his fingers to expand the image on his phone. I thought that was brilliant! I don’t run into that issue unless I’m wearing multi-focal contacts, which I am trying again right now with zero success as usual. I won’t bore you with that story. Since I’m quite nearsighted and usually wearing glasses, I can just lift up my glasses to read tiny writing, but I wanted to share this cool life hack with you in case you run into this issue from time to time. Amazing all the stuff we can do with a cell phone! I enjoy the occasional Ice Coffee but it’s hard to find without sugar unless you get it completely plain. I just discovered yesterday that Dunkin Donuts has unsweetened ice coffee in several different flavors. So far I’ve just tried their Toasted Almond (purchased via the drive-thru) and it was yummy! I’m looking forward to trying some of the others. Early last year, I discovered those trash bags at Walgreens because I had a coupon. And I love them!!! Just the right fit….great buy. Those stylus pens are handy with my IPhone too. Even though I have the 8+ which is bigger I have a heck of a time with the keypad because I guess my fingers are too big. I’m relieved I don’t have to pay any taxes this year! My March favorites are the flowered packing cubes I bought for England and the embroidery class I found while scrolling through available activities with my Airbnb booking in London. You embroider (haven’t done that since I was 12) a map of a favorite London area with a needlework expert. Then you can frame it or I guess make a pillow out of it. And purely for fun I ordered magnetic false eyelashes for just the outer half of the eyelid. Somehow, my lashes have gotten skimpier and skimpier. Oh, and the purse hooks I ordered because I don’t have a console in my car are working if I can get myself in the habit of hanging my bag on them so that’s thanks to you! I bought the urge catcher. My purses are usually mid to small tote size. That meant my purse did not fit in the catcher/sling. Would appreciate a picture. I shared the product at my hair salon so word is spreading about this clever product. 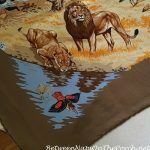 Hi Frances, I just added two additional photos to this post to show how it looks when I use a tote/larger bag. I mostly carry small to medium size bags, but I do occasionally carry a small tote as seen in the photos. Hope this helps! Love the Agatha Raisin series. Did you know that Series 2 is coming out on DVD to be released May 7, 2019. You can pre-order it on Amazon and probably other places. I left my glasses home and oh boy I could not see prices or labels. So frustrating! Wish I had thought of using my phone. Great idea! Hi, In regard to your multifocal contacts, have you tried ordering one much weaker than necessary? I got to the point that I was having to put reading glasses on to eat my food because the plate was so out of focus with regular contacts. I ended up getting full strength in my dominant eye (350) but the eye that normally needs 250, I got in 125. It took a few days but my eyes adjusted and I’ve been doing this for five years now. I still occasionally have to drag out reading glasses in dark restaurants or for very tiny print but most of the time I can read fine. It just takes a little perseverence to not give up the first try. I also know people that just wear one contact lens, but my nearsightedness is pretty bad so that was too uncomfortable for me. Love, love, love the handbag holder-you did it again! Thank you!!! 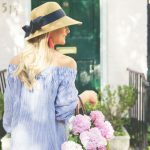 As I am totally addicted to your blog, I remember than you had jeans marks on your car seats which I now have but cannot remember how you fixed it!!! Help!!! June’s journey. It lets you be a detective, city planner, designer and there’s an ever changing story line that takes place in vintage times. You earn rewards by building villages and solving crimes for June. So fun! You have to watch a few ads for it to be free, but everything has ads these days so not a big deal. I forgot to mention that Agatha Raisin actress is in another series called Love, Lies and Records. There’s only been one season but we enjoyed it. Meg, I just added two additional photos to this post to show how it looks when I use a tote/larger bag. I prefer smaller/medium size bags but it will work with a larger bag, you just have to lengthen out the straps a bit more to give it more space/room. 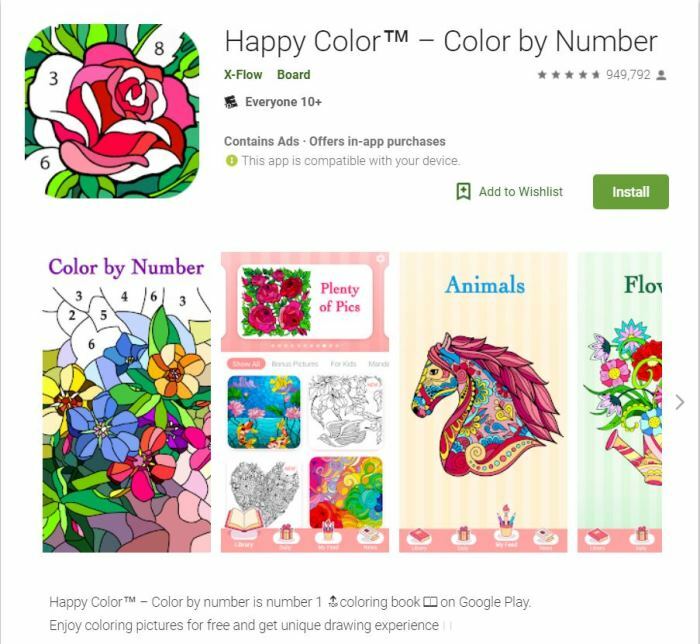 My sister introduced me to Happy Color while my Mother was in hospice. Such a fun way to pass time! We are going on a tour of Scotland and Ireland next fall so I love all your traveling suggestions especially since this will be our first overseas trip. Thank you! Reading your comment about the fella who took a photo of what he was having difficulty reading I thought of a recent life hack a friend of mine told me about. Three of us were headed out to dinner and one of said ” I don’t have a mirror ….” My other friend told us to take out our phone, reverse the camera shot and then we can see ourselves. Most likely other folks have thought about this but I had not. I’d never heard of Agatha! Thanks! Have you watched the Marvelous Mrs. Maisel on Amazon Prime? Awesome!! The clothes, the cars, the fully developed characters — all are amazing! Love hearing about all the products you like. I have bought a slew of them from your links. Also want you to know that you ought to check out the Elta MD 41 spf sunscreen. It’s tinted and works like a moisturizer under makeup too. Hats are great but aren’t foolproof for sun damage. As someone with fair skin and personal experience with basal cell carcinoma, you can’t be too careful with the sun. Susan, I just have to tell you how much I’m enjoying my Car Cache handbag holder! I ordered it as soon as I read your post, and it is working great!! Thanks for sharing! I also do the trick with my cellphone when I can’t see something up close. My vision is terrible, and I still do that trick WITH my glasses on! Lol! Hello Susan, As for a great app, we travel quite a bit and have fun with the Hotel Tonight app. 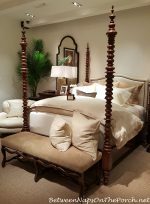 I specify the 4-5 star hotels, the app shows excess rooms that are substantially discounted for that night or the next. We have had such success that we don’t worry by not always having a room booked ahead of time. The app works on that day hotels, primarily. Thank you for the recent PB sale info, I got the darling bunny bowl! I just ordered the car handbag holder. It was on sale for $16.99! My purse just fell on the floor of my car the other day which reminded me lol! Thanks for all your great suggestions. I love reading your blog and living vicariously through you on all your trips. 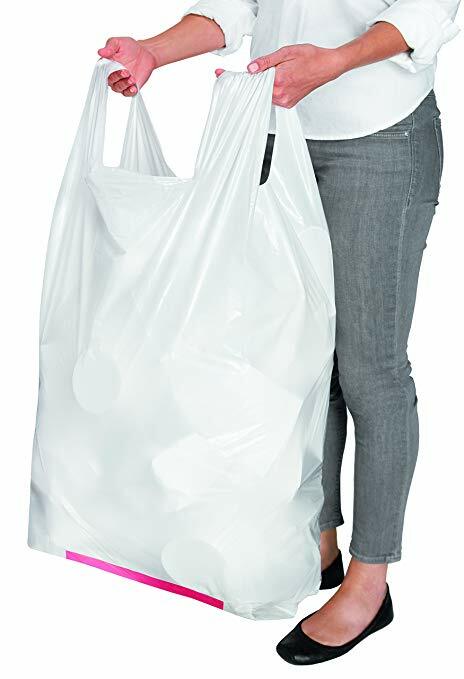 Thanks for the suggestion about the trash bags — I much prefer the handle-tie bags and they’re difficult to find. One of our local groceries used to have them in their store-brand line of products but discontinued the handle-tie variety, and the usual national brands don’t seem to make them. I hadn’t thought to look online for other brands or sources! I bought, and installed, the purse holder! Best invention ever. I do a lot of car pooling with girlfriends for local trips, and it was always a pain asking someone to hold my bag. I am volunteering to drive on Tuesday to see Happy Hens, an organic chicken farm, just so I can show off my new device. I like the handbag holder, I might have to order myself one of those. I do the take a picture thing and enlarge it myself! I am sorry to hear you are having trouble with multi-focus contacts. I used to do the one reader in one eye and none in the other, until my reading got so bad that the difference between the two just didn’t work for me. I was hoping to go the multi focus route. Fingers crossed. Have a great week! Thanks for the jam-packed blog today. You get my vote for the best ‘influencer.’ Really, you qualify to be one of those, don’t you? We who are your fans certainly buy enough of the products you recommend. 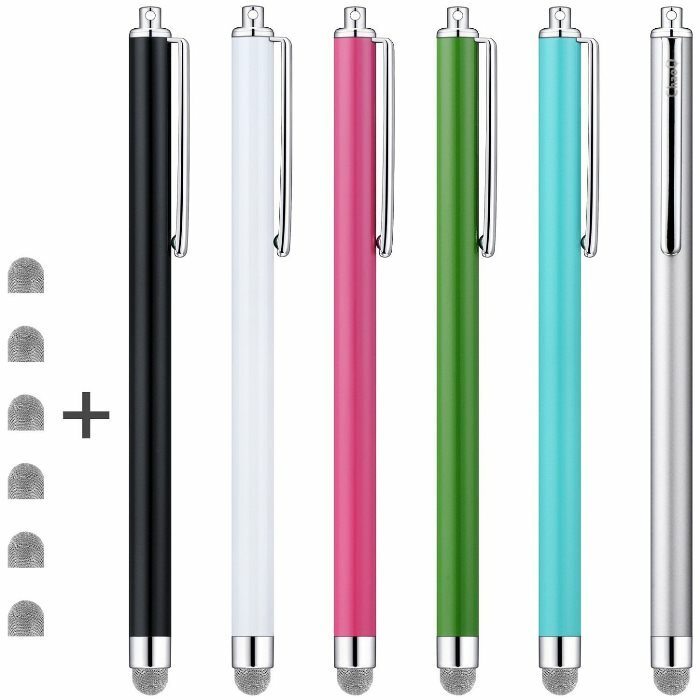 Today I ordered the styluses, as one can never have too many of those. I have a lifetime supply now, I think. As for wearing sunscreen, you may want to watch Dr. Dray on YouTube. I watch her, but since I mostly stay indoors I do not use sunscreen faithfully. Dr. Dray is rather fanatical about it, but she’s a dermatologist. Think about it. Take care. Absolutely love Agatha Raisin. Well, all things British, really. So excited to see season 2. 1. I never use plastic bags for lining garbage cans. Just adds more stuff to the landfill and slows down composition of the garbage. Sorry if this was already mentioned but iPhone has a built in magnifying glass, I use mine all the time. You have to turn on the app but after that it’s easy. I have an iphone8 but I think activating it was the same on my old phone. Just go to SETTINGS, GENERAL, ACCESSIBILITY, MAGNIFIER and turn on the app. It gives you a slider to magnify a little or a lot. That’s cool about the built-in magnifier. I wonder if my Samsung phone does that. I’ll have to check. I know it has a built-in flashlight. Multi focal lenses didn’t work for me at all. I tried twice and gave up. My eye doctor then suggested I try one eye with a -2.50 when the actual prescription is -3.50 and the other is accurate at -3.25. That has been working much better. If I had the courage to get LASIK I would. I’m staying away from Lasik. I know too many people who have had it and hate and are still in glasses. I am very near sighted as well. Right now I’m wearing a regular lens in my dominate eye and a multifocal in the other. Both are the Biofinity brand. Seems to be working well. Interesting! I haven’t heard of doing that. Thanks, Cathy! my sister has had success enlarging the ingredient lists on packaged foods with her phone camera! i never would have thought of doing that. . . i’m on my way to amazon to check out the purse holder again! I bought the handbag holder when you featured it in your first post. I had some friends in the car after I had installed it and they promptly ordered one of their own. Thanks for the tip. I’m constantly telling people about the tips and tricks you share on your blog.